Lakeside Skipper Richard Lawson is proud of his team — despite their Grand Final drubbing at Workington. Hammers team boss Will Pottinger had urged his men to hit the home side early and prevent them building up a head of steam. 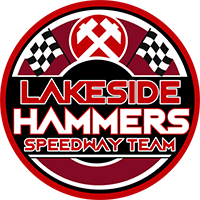 But Lakeside were powerless as the Comets, who have been in scintillating form on their own circuit of late, wiped out the Hammers’ 10-point lead from the first leg in the space of only three races. The visitors could produce only two race winners in Lawson and Adam Ellis and one heat advantage as they struggled with set-ups at a circuit where — the abandoned league match when Dan Bewley was injured apart — they have not raced this season. Workington’s high-powered Danish trio, plus guest Tero Aarnio, continually racked up the points and after just 11 races the home side needed only to provide a finisher in each heat to claim the crown. “Obviously they go well round here and they caught us big-time,” said Lawson. “Early on we weren’t getting out of the starts and struggled for speed — the track was so slick. “It was difficult. We never stopped trying, but the scoreline doesn’t reflect that. “We were pushing and I couldn’t ask any more from all the team. “It’s been a tough season, but to get to the final is something to be proud of. “We’ve had the same seven guys throughout the season, which says a lot, and the fans have stuck by us with the switch to Rye House. “Everything’s been against us — but we’ve still managed to get ourselves here, to a final. The Hammers must now regroup for tomorrow’s Shield final second leg at the same venue, where they trail by two points from the home leg, as Workington chase a Cup, league and Shield treble. All at the Hammers send our congratulations to the Comets. Image; Adam and Kyle in action. Credit Dave Payne.